I've called this an empanada, but you can call it whatever you like... A pasty, a meat pie, a hot pocket a samosa... After some research, it seems that many countries and cultures have their own version of this pastry filled with a meat & veggie filling and while they all have a different name, the idea is basically the same. 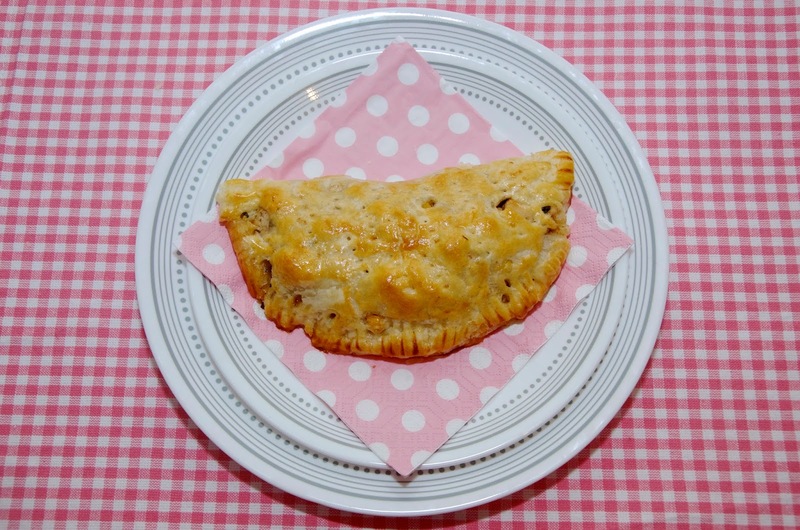 A delicious pastry (puff pastry in this case) filled with a hot, savory filling. It can be an appetizer, a party food or a main course with sides all wrapped into one tasty, hot parcel. It's the perfect anytime, anywhere food and it's quite possibly one of the most satisfying things in the world despite its simplicity. This recipe is pretty simple and pastry phobes need not fret... I've used pre-made pastry. I pretty much always use pre-made pastry because I'm not a pastry maker. If you're a champ at making pastry, then good for you - you can totally make your own to use here if you like. I find the whole process stressful, intimidating and useless since I can buy perfectly wonderful pastry in a box across the street from my house, but that's just me. If I had to make it myself, we'd never have empanadas in this house and that would be just terribly sad. In short, I make many things, but pastry isn't one of them... If that sounds like you, then this recipe should suit you just fine. Either way, it's absolutely delicious, so enjoy! 2. Heat 2 tablespoons of the garlic oil on medium high heat in a large frying pan and brown the chicken on all sides, continuing until it's cooked through. Remove the chicken with a slotted spoon and set aside. 3. Reduce the heat to medium and cook the shallots in the remaining garlic oil for about 5 minutes or until they start to turn translucent and are cooked through. If needed, reduce the heat to medium low and take care not to burn them. 4. Add the cinnamon, coriander, Tabasco and salt & pepper to taste. Stir on the heat for another minute or so with the shallots to combine before adding the chicken back to the pan. Finally, add the double cream and stir to combine. Let it bubble away for 2 or 3 minutes to thicken slightly before removing the pan from the heat and setting aside to cool. You should have a thick, savory, creamy filling for your empanadas. 5. While the filling is cooling, roll out the pastry on a lightly floured surface. If you're using Jus-Rol you can just unroll it, leaving the pastry lying on the non-stick paper it comes rolled up in. Use a small saucer or bread plate as a guide to cut out circles from the pastry dough. There's not a severe requirement for size here... 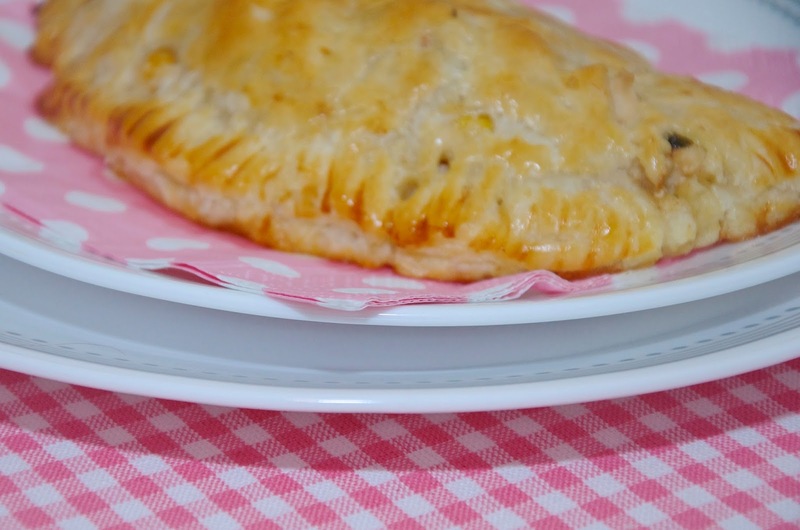 If you use a small saucer, you will simply have more, smaller empanadas. If the saucer you use is quite large, you'll only have a few, bigger empanadas. The choice here is yours. 6. Once you've cut out all the pastry circles, divide the filling equally among them, placing the filling on only one half of the pastry circle. Brush the edges of the pastry with beaten egg, fold over the pastry and press the edges together, sealing the filling inside. Crimp the edges with a fork and prick the tops of the empanadas. 7. Prepare a baking sheet with non-stick cooking spray and place the empanadas on it. Brush the empanadas with some of the remaining beaten eggs and sprinkle lightly with sea salt flakes. 8. 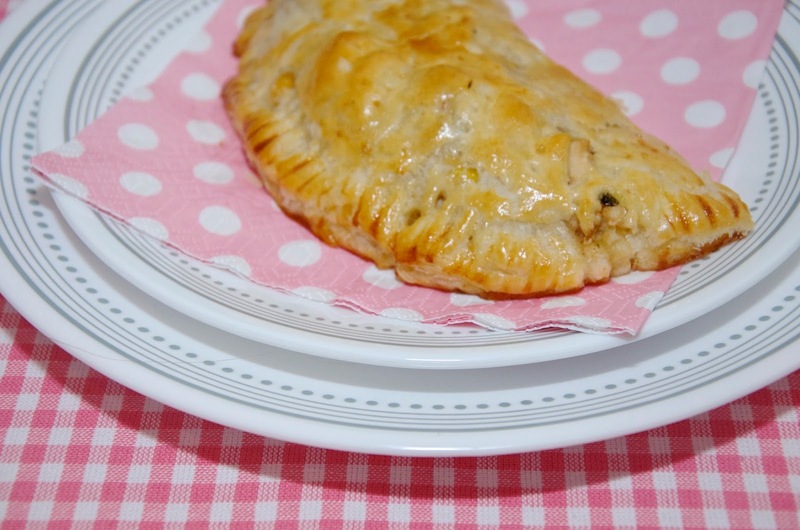 Bake the empanadas in the preheated oven for 20 minutes or until golden brown and piping hot. Serve hot.